A number (which we assume of at least 2 digits) such that the sum obtained inserting a "+" among its digit in any position gives a prime. For example, 4001 is magnanimous because the numbers 4+001=5, 40+01=41 and 400+1=401 are all prime numbers. 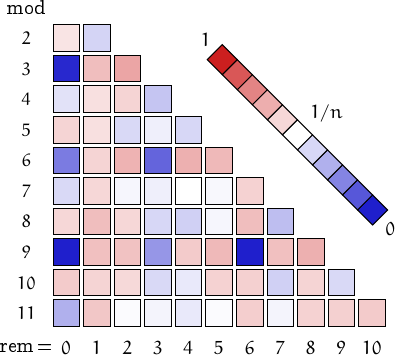 Since all the prime numbers are odd, except for 2, all the magnanimous numbers, except for 11, are either a sequence of odd digits followed by an even digit, or a sequence of even digits followed by an odd digits. It is conjectured that the magnanimous numbers are finite and that probably the largest one is 97393713331910, while the largest one which is also a prime number itself is probably 608844043. The following table summarizes their frequency as a function of the number of digits, reporting the smallest, the largest and their quantitity. 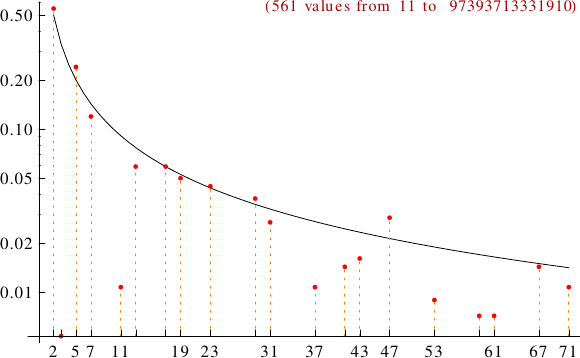 A graph displaying how many magnanimous numbers are multiples of the primes p from 2 to 71. In black the ideal line 1/p.